Anyone who’s worked in an agency is all too familiar with the term “fire drill.” Those two little words may even conjure bad memories of a race-to-the-finish, last-minute project or a client call that sends your blood pressure skyrocketing. Some degree of stress comes with the agency territory of fast-paced decision-making. 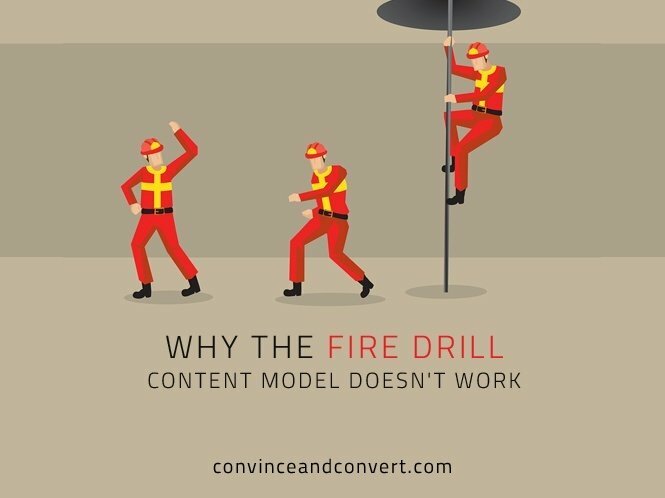 But the risk of “fire drills” increases even more as agencies become overloaded with content—both for clients and their own internal purposes. The more overloaded an agency becomes, the more likely it is to burn through staff members or crank out work at the last minute, resulting in subpar content that benefits no one. Here’s why this method doesn’t work, and how your agency can restructure its content-creation processes to be more efficient and scalable. Content creation is a great way to maintain an ongoing relationship with clients, not to mention an effective method for acquiring and retaining customers. But often, agencies haven’t scaled to accommodate the content demands. Content tends to get a “cross that bridge when we come to it” approach, meaning agencies never have a chance to assess how best to triage content needs for clients. Many agencies want to hitch their wagons to the train of content marketing and strategy. They think that just because they have copywriters and account managers, they have a content marketing team. As a result, agency copywriters (and some account managers) are being asked to shoulder the burden of content creation for clients—even though they have drastically different areas of expertise. And often, these employees weren’t hired to execute ongoing content needs. Now, their skill sets are misaligned with the content needs of the client. The agency world is a fast-paced environment driven by deadlines. Client requests are made at the last minute, and it can be at the expense of the time you’ve set aside to write that blog post. The reality is that most agencies are no better than their clients at managing time when it comes to writing blog posts. The post gets relegated to low-priority status, and only in the eleventh hour does it finally get written—with little time for review, editing, or a thoughtful promotion of lead generation strategy. In fact, a lack of time or bandwidth is the number one content marketing challenge for businesses. The agency/client model is flawed when it comes to planning content as well. Agencies plot out these perfect editorial calendars, get their clients to sign off on them, draft the first posts, and ask their clients to review and return it at an appointed day, and the clients don’t respond. All of that planning goes out of the window. This happens all the time, creating a backlog followed by an overflow of content. Show the value of your work. The agency that can prove its value will carry the day. Show value through measurement, and shift the conversation from literary merit to performance. What’s a great blog post if no one reads it? Though it may take extra time to put in measurement processes upfront, it will be worth it when you can easily quantify ROI for clients. Don’t forget the little things. Agency/client relationships erode slowly—it’s the “death by a million cuts” mentality. Small, easy mistakes kill client relationships much more than single, major blunders. Be sure to check spelling, proof, edit, and absolutely have another person review a piece before sending it to a client. Skipping these steps or working on compressed timelines can result in fixable mistakes slipping through the cracks. Manage client expectations from the start. Build in more time than everyone thinks is necessary to allow for wiggle room. Agencies are people pleasers and tend to overpromise and under deliver. Turn that on its head by underpromising and overdelivering. Overcommunicate whenever possible. Share metrics on a consistent basis, reviewing both process and progress with clients. Don’t just put your content strategy on autopilot once the proposal and editorial calendar are approved. Hold the client accountable. If expectations are clearly communicated, agencies shouldn’t feel guilty about holding clients accountable. Timelines are critical for review, feedback, and promotion of content. When time is precious, typically the first draft is the final draft—and, as Ernest Hemingway put it, “The first draft of anything is s—.” If a client is late, you should feel entitled to tell the client that the deadlines will have to move. But by playing into this idea, you’ll only be feeding the “fire drill” mentality. Instead, focus on producing quality work, sticking to deadlines, and holding the client accountable when necessary. Your colleagues—and blood pressure—will thank you. Scott Yates is CEO of BlogMutt, the leading site for businesses and agencies to buy blog posts. Scott, along with co¬founder Wade Green, built BlogMutt to be the one site that makes it easy for businesses to get posts so necessary in today’s inbound marketing world, and make it easy and fun for freelance writers to create those posts. Scott lives in Colorado with his wife and son, their mutt, Buddy, and his dictionary collection.